This site was designed to inform people about the dangers associated with a potentially deadly toy known most commonly as the Water Yo-Yo Ball. However, this toy is also sold under a variety of other names such as the Yo-Yo Meteor Ball, Yo-Yo Sport Ball, Yo-Yo Noodle Ball along with others. On September 24, 2003, the U.S. Consumer Product Safety Commission (CPSC) issued what is believed to be a very mild Advisory about the results of their investigation of this toy. The CPSC's Advisory stated that there were only 7 reported cases of bruising and broken blood vessels. In our opinion, the CPSC did not disclose the true nature of reported injuries. The CPSC failed to mention that children had been found unconscious, lifeless, gasping for air, foaming at the mouth with their faces turning colors. In addition, the CPSC neglected to mention the fact that children have been hospitalized due to their injuries from the toy. Some children even sustained permanent eye injuries which required surgery and ongoing medical treatment. As of December 13, 2007, the CPSC has received 409 reported injuries related to this toy, 294 of those injuries were classified as suffocation/strangulation. One child passed out and hit his head so hard he sustained a skull fracture while another child was found bleeding from his mouth and nose requiring CPR. Two children have had lens implant surgery because of severe eye trauma when the cord of the toy snapped back and hit them with such force that it shattered the lens. Lisa and Tina have been working to get this toy banned for sale in the United States as it has been in several countries around the world. The CPSC continues to refuse to take the necessary action to protect our children. The CPSC has received requests from Consumer Advocates and Politicians around the country who support a national ban of this toy. 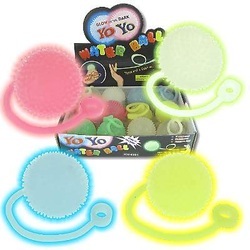 U.S. PIRG included the Yo-Yo Water Ball in their Annual Trouble in Toyland Report in 2003, 2004 and will again in 2005. In addition, U.S. PIRG called upon the CPSC to issue a national ban in 2004 and will do so again in 2005. State Legislatures have also begun to take action. On June 8, 2005, SB1960 was signed into law making Illinois the first State in the country prohibit the sale of the toy. This Bill was Sponsored by Senator Jeffrey Schoenberg (IL-D). A Companion Bill was sponsored in the House by State Representative Elizabeth Coulson (IL-R). In New Jersey, the bill S780 which was sponsored by Senator Fred Madden (NJ-D) and bill A428 which was sponsored by Assemblymen David Mayer (NJ-D) and Paul Moriarty (NJ-D) have just passed avote in both the Senate and the Assembly. Once the Governor signs the bills, New Jersey will be the second state to ban the sale of this toy.The States of New York and Wisconsin have also introduced bills to ban the toy. At the Federal Level, Congressman Rob Andrews (NJ-D) sponsored a Bill which was Co-Sponsored by Congresswoman Jan Schakowsky (IL-D). HR3738 was introduced on September 13, 2005. If your child has been injured with this toy or you know of a child that has been injured, we ask that you please contact your Congressperson, Senator and your State Representatives, by clicking on the links at the bottom of this page, and ask them to join in the fight to help ban this toy! Dangerous Toys should not be allowed to be sold in the United States. The CPSC must become responsible by informing people of the true nature of the dangers associated with the yo-yo water ball toy and all variations of this toy. Consumers rely on the CPSC to provide accurate safety information pertaining to products that they buy. We must continue to urge the CPSC to fulfill the duty of protecting consumers, especially the smallest ones; OUR CHILDREN, from unsafe products! Nothing is more valuable in this world than our children!! This site is a combined effort by Lisa Lipin and Tina-Lyn Casadei-Alleruzzo. Congressman Robert Andrews (NJ-D) introduced a bill (#HR3738) into Congress on September 13, 2005 which would ban the sale of Yo-Yo Waterballs. The bill was Co-Sponsored by Congresswoman Jan Schakowsky (IL-D). It was forwarded to the Committee of Energy and Commerce. Illinois State Senator Jeff Schoenberg, introduced a bill (#SB1960) to ban the toy from being sold in Illinois. This bill was signed into law on June 8th, 2005! Assemblyman David Mayer's bill (#A428) to ban the toy from being sold in New Jersey, and Sen. Fred Madden's bill (#S780) have both passed through the Senate and the Assembly. The bill was signed into law on January 3rd, 2008 by Gov. Jon Corzine. Lisa Lipin lives in Skokie, Illinois (suburb of Chicago). She has been working on getting the yo-yo water ball banned in the U.S. since July 2003, when her then 5yr. old son, Andrew, was injured when the cord wrapped around his neck strangling him. Lisa has been working closely with politicians in IL and around the country. She is responsible for bringing this very important child safety issue to the media in Chicago which prompted other stories around the country. She also contacted many parents around the country after reading their stories in the incident reports that she received from U.S. Consumer Product Safety Commission. Lisa contacted Tina in December 2003 after reading an article on line in the Philadelphia Enquirer about TIna's daughter who also was strangled by the cord of the toy. Lisa recently testified at a Congressional hearing in Washington D.C. about the current Consumer Product Safety Standards. She specifically addressed the issue of the yo-yo waterball and urged Congress to take action. Tina-Lyn Casadei-Alleruzzo lives in Maple Shade, New Jersey. Her daughter Casadei Schreffler was also strangled with this toy while her father was only 10 feet away from her. Tina has been working with her Congressman, Senators and her state politicians after she was contacted by Lisa Lipin in December of 2003. She has been on all of the Philadelphia News channels in order to try to get this information out to the public. Tina testified at a hearing in front of Consumer Affairs Committee on the bill introduced by Assemblyman Mayer which banned the sale of water yo-yo's in New Jersey.